Brandie Yeik, right, with U.S. Women's Ski Team members Julia Mancuso and Sarah Schleper, of Vail. EAGLE – As the world, nation and especially this valley avidly watched the exploits of the women’s U.S. Ski Team at the 2010 Olympics, Brandie Yeik of Eagle had one of the best vantage points imaginable. She was stationed at the race start gate on Whistler Mountain. For the past two years, through her job at the Howard Head Sports Medical Center, Yeik has worked as an athletic trainer for the national women’s ski team. 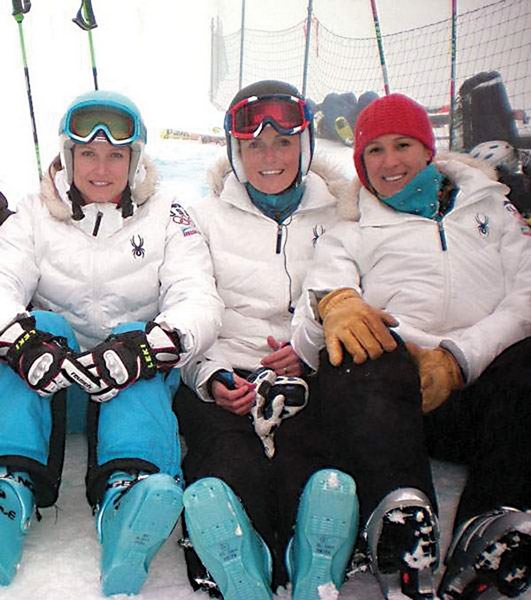 She specialized in the technical events – slalom and giant slalom. “It is a really cool job. It is the best position ever,” said Yeik. That’s not to say it’s an easy gig. The past two years have been jam packed with travel, and Yeik followed the team around the world from August through March. The team actually makes its home base in Austria because of the amount of European events on the schedule. When she signed up to work with the team, the 2010 Olympics were always the big event on the horizon. Yeik said the games lived up to their billing. She arrived in Canada the very day Lindsey Vonn won the gold medal and Julia Mancuso won silver in the women’s downhill. Attending that medal ceremony was one of Yeik’s first Olympic activities. It was a very moving moment, Yeik said, after spending so much time with the women on the team and seeing how hard they worked to get to the Games. The action didn’t let up from there. On race days, Yeik was up on the mountain helping trainers and giving course reports. She would relay information and help prep competitors. Off the hill, she assisted with rehabilitation, recovery and injury prevention. As much as she would have liked to, Yeik said she simply didn’t have time to see any of the other Olympic events. But she did get the chance to hang out in the athlete’s village and soak in some of the atmosphere. There were several concerts at the venue, and there was a 24-hour McDonalds at the site. What impressed her most was the international flavor. While she was busy in Canada, Yeik’s family was busy at home watching for a glimpse of her on television. At one point, her mother Norma Yeik swears she could hear her daughter speaking. As she reflects on her once-in-a-lifetime Olympic experience, Yeik said she has been fortunate to be in the right place at the right time. As a certified athletic trainer, Yeik earned a bachelor’s deign in health and sports medicine and a master in sports administration. She eventually earned a fellowship through the Steadmen Hawkins Clinic that ultimately led to her job with the Howard Head Sports Medical Center. When her employer opted to sponsor an athletic trainer position for the women’s ski team, Yeik jumped at the chance to work with the group. “It’s a fun group of girls and the coaches are amazing,” she said. She will finish up this racing season and then decide what’s next for her life and career. When she isn’t traveling with the team, she works out of the Eagle Howard Head clinic. And despite her busy travel schedule, Yeik has found time to become engaged to a young man named Kenny Martin.